Fr. Sean McManus, founder of Irish National Caucus in Washington, launches his memoir; ‘My American Struggle for Justice in Northern Ireland’. Co. Dublin, Ireland — 04 Apr. 2011 — For almost forty years, Fr. Sean McManus has been at the heart of the Irish-American campaign against injustice in Northern Ireland. My American Struggle for Justice in Northern Ireland is his personal account of how he mainstreamed Northern Ireland on Capitol Hill, after Church and State exiled him from Britain to silence him on the issue in 1972. For almost forty years, Fr. 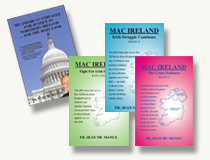 Sean McManus has been at the heart of the Irish-American campaign against injustice in Northern Ireland. My American Struggle for Justice in Northern Ireland is his personal account of how he mainstreamed Northern Ireland on Capitol Hill, after Church and State exiled him from Britain to silence him on the issue in 1972. There, he founded the Irish National Caucus, “the driving force that would diminish Britain‟s influence with the US government”. He forced through Congressional action to stop the sale of US weapons to the RUC and made the MacBride Principles on fair employment a powerful force. All this time he was opposed not only by the London and Dublin governments but also – and ironically and inexplicably by elements in the Republican Movement. In 1958, when he was 14, Sean McManus’ eldest brother, Patrick, died when an IRA bomb he was transporting exploded prematurely. Since then he has been haunted by the Troubles. As a Northern Ireland Catholic priest he has gone on to break one of the biggest taboos in Britain, speaking out as an Irish priest to criticise Her Majesty‟s government regarding Northern Ireland. In 1972, the outspoken, controversial and justice-seeking priest was exiled from the UK Catholic Church for criticising Her Majesty‟s Government. He travelled to America where his life-long struggle for Northern Ireland justice began. In 1974 Sean took over the British Embassy in a non-violent protest, pouring blood over the inside walls. He was arrested and spent the night in prison. Later that same year, attempting to break the U.S. media silence on Northern Ireland, Sean briefly took over ABC national news in Washington and made his own announcement. 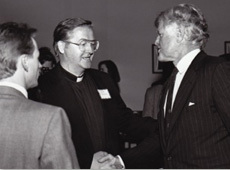 He set up the Irish National Caucus on Capitol Hill, the leading US initiative in setting the Irish American agenda on the Northern Ireland issue and began to exert significant American pressure for justice in Ireland. As an independent lobbyist McManus fought to get the US Congress to stand up for justice and peace in Northern Ireland. For his efforts, he faced demonization, systematic attacks and became an enemy of almost every interested party imaginable. Facing opposition from not only the London Government but also the Dublin Government, the IRA, Sinn Fein and others only served to motivate him more. McManus’ success in getting Jimmy Carter to break the ‘hands-off’ Northern Ireland policy only served to antagonise the Dublin Government who tried to make Carter back off entirely. In 1977 the INC initiated the formation of the Ad Hoc Congressional Committee for Irish Affairs and faced great opposition from the Irish Ambassador Sean Donlon who went to huge lengths to oppose him. The INC initiated and launched the historical Mac Bride Principles Campaign. Seán McManus, a Redemptorist priest, is a brother of Frank McManus, former MP, and Patrick McManus, an IRA member killed in 1958. In 1971, he was arrested in Northern Ireland during an anti-internment demonstration. His superiors sent him to the US where he founded the Irish National Caucus in 1974.